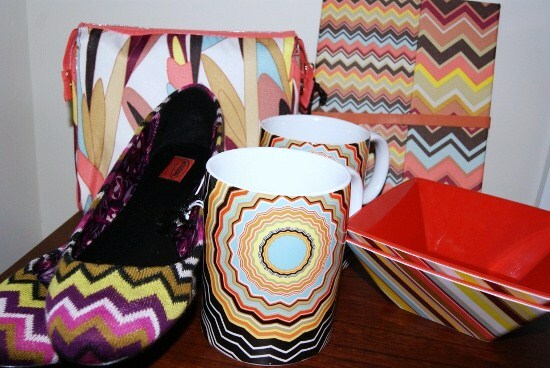 I was lucky enough to get a few lovely pieces from the Missoni for Target line today. I wasn't there when the store opened but sauntered in at lunch to find a sales associate restocking a few goodies and hinting of more. I went specifically looking for the coffee mugs ... the ballet flats, makeup bag and journal were the bonuses. Love it! I've got to get there--or if all else fails, hopefully I can land a few things online. I think your best bet will be to drop into a Target on the outskirts of the Perimeter. The online store seemed to sell out quick, but there are still things on the shelves. I love those mugs and the makeup bag! Must haves! I really like those flats; I wonder if they have anything lurking in Sandusky. I need to get to Target and get my hands on some Missioni... at least what's left of it!